Selling is the highest paid profession in ANY industry. Learning the art of selling is a skill that very few truly master, yet it is the skill that is MOST valuable and needed in all businesses. Here at National Sales Academy, our sole aim is to help professionals become Sales Authorities. 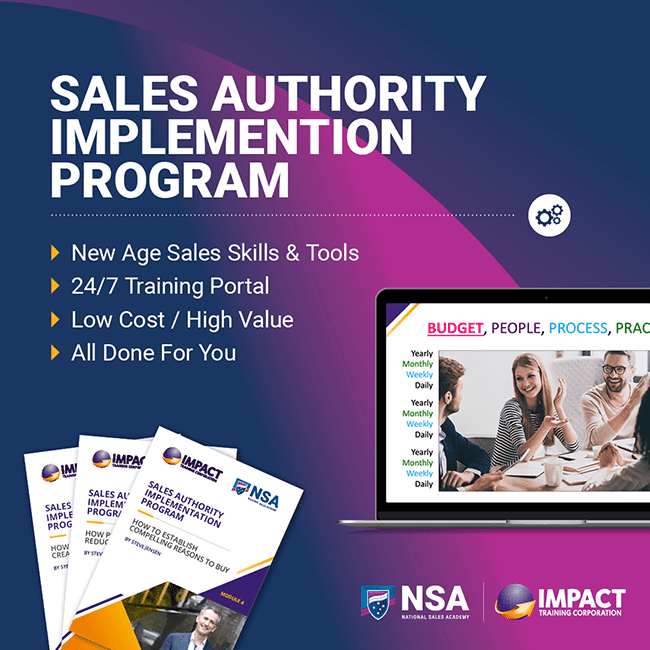 The NSA Implementation Program will teach you the secrets of inspirational selling and equip you with the right tools in the first step in becoming a Sales Authority. The Sales Authority Implementation Program is an online portal with a training program to work through. It consists of 6 modules. Once completed, you will make more sales and master the important tools of selling. When it comes to mastering a skill, time and practice are the magic ingredients. There will be tools and scripts for your business to use to ensure that you will master your new learned sales techniques to every day business. Accountability is very important, one of our NSA experts will mentor you throughout the process with a few touchpoint throughout the year. The best part is that you and your team will be become an elite member of our online Facebook community with like-minded success driven people to share ideas, connect and learn more every week through our Sales Live series. Once you have mastered the skills obtained from the Sales Authority Implementation Program you progress to the Sales Authority Club which combines online training with face to face training. We have designed a unique blend of advanced hard skills and soft skills that will help you become a sales authority and smash your targets. I had the privilege of doing the Sales Mastery Course with NSA few years back and it changed my life forever. Steve will teach you the skills and techniques to maximise your true income potential. His methods of coaching, leading and communicating are truly infectious and he delivers every time with such conviction and passion that you can't help but be moved to implement what you've learnt and in doing so you achieve some truly amazing things.